"Flemings" redirects here. For other uses, see Flemings (disambiguation). ^a U.S. population census does not differentiate between Belgians and Flemish, therefore the number of the latter is unknown. Flemish people might also indiscriminately identify as Dutch, due to their close association, shared history, language and cultural heritage. There were as many as 4.27 million Dutch Americans, unknown percentage of which might be Flemings. The Flemish or Flemings (Dutch: Vlamingen; Dutch pronunciation: [vlaːmɪŋɛn] ( listen)) are a Germanic ethnic group native to Flanders, in modern Belgium, who speak Flemish, but mostly use the Dutch written language. They are one of two principal ethnic groups in Belgium, the other being the French-speaking Walloons. Flemish people make up the majority of the Belgian population (about 60%). Historically, all inhabitants of the medieval County of Flanders were referred to as "Flemings", irrespective of the language spoken. The contemporary region of Flanders comprises a part of this historical county, as well as parts of the medieval duchy of Brabant and the medieval county of Loon. The sense of "Flemish" identity increased significantly after the Belgian Revolution. Prior to this, the term "Flemings" in the Dutch language was in first place used for the inhabitants of the former County of Flanders. 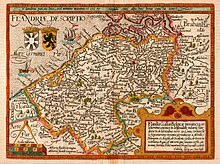 Flemish however had been used since the 14th century to refer to the language and dialects of both the peoples of Flanders and the Duchy of Brabant. The modern Belgian province of Limburg was not part of the treaty, and only came to be considered "Flemish" in the 19th century. In 1830 the southern provinces of the United Netherlands proclaimed their independence. French-dialect speaking population, as well as the administration and elites, feared the loss of their status and autonomy under Dutch rule while the rapid industrialization in the south highlighted economic differences between the two. Under French rule (1794–1815), French was enforced as the only official language in public life, resulting in a Frenchification of the elites and, to a lesser extent, the middle classes. The Dutch king allowed the use of both Dutch and French dialects as administrative languages in the Flemish provinces. He also enacted laws to reestablish Dutch in schools. The language policy was not the only cause of the secession; the Roman Catholic majority viewed the sovereign, the Protestant William I, with suspicion and were heavily stirred by the Roman Catholic Church which suspected William of wanting to enforce Protestantism. Lastly, Belgian liberals were dissatisfied with William for his allegedly despotic behaviour. Following the revolt, the language reforms of 1823 were the first Dutch laws to be abolished and the subsequent years would see a number of laws restricting the use of the Dutch language. This policy led to the gradual emergence of the Flemish Movement, that was built on earlier anti-French feelings of injustice, as expressed in writings (for example by the late 18th-century writer, Jan Verlooy) which criticized the Southern Francophile elites. The efforts of this movement during the following 150 years, have to no small extent facilitated the creation of the de jure social, political and linguistic equality of Dutch from the end of the 19th century. After the Hundred Years War many Flemings migrated to the Azores. By 1490 there were 2,000 Flemings living in the Azores. Willem van der Haegen was the original sea captain who brought settlers from Flanders to the Azores. Today many Azoreans trace their genealogy from present day Flanders. Many of their customs and traditions are distinctively Flemish in nature such as Windmills used for grain, São Jorge cheese and several religious events such as the imperios and the feast of the Cult of the Holy Spirit. Map of the medieval County of Flanders. Within Belgium, Flemings form a clearly distinguishable group set apart by their language and customs. However, when compared to the Netherlands most of these cultural and linguistic differences quickly fade, as the Flemish share the same language, similar or identical customs and (though chiefly with the southern part of today's Netherlands) traditional religion with the Dutch. However, the popular perception of being a single polity varies greatly, depending on subject matter, locality and personal background. Generally, Flemings will seldom identify themselves as being Dutch and vice versa, especially on a national level. This is partly caused by the popular stereotypes in the Netherlands as well as Flanders which are mostly based on the 'cultural extremes' of both Northern and Southern culture. But also in great part because of the history of emancipation of their culture in Belgium, which has left many Flemings with a high degree of national consciousness, which can be very marked among some Dutch-speaking Belgians. Alongside this overarching political and social affiliation, there also exists a strong tendency towards regionalism, in which individuals greatly identify themselves culturally through their native province, city, region or dialect they speak. Flemings speak Dutch (specifically its southern variant, which is sometimes colloquially called 'Flemish'). It is the majority language in Belgium, being spoken natively by three-fifths of the population. Its various dialects contain a number of lexical and a few grammatical features which distinguish them from the standard language. As in the Netherlands, the pronunciation of Standard Dutch is affected by the native dialect of the speaker. At the same time East Flemish forms a continuum with both Brabantic and West Flemish. Standard Dutch is primarily based on the Hollandic dialect (spoken in the northwestern Netherlands) and to a lesser extent on Brabantic, which is the most dominant Dutch dialect of the Southern Netherlands and Flanders. Approximately 75% of the Flemish people are by baptism assumed Roman Catholic, though a still diminishing minority of less than 8% attends Mass on a regular basis and nearly half of the inhabitants of Flanders are agnostic or atheist. A 2006 inquiry in Flanders, showed 55% chose to call themselves religious, 36% believe that God created the universe. The official flag and coat of arms of the Flemish Community represents a black lion with red claws and tongue on a yellow field (or a lion rampant sable armed and langued gules). A flag with a completely black lion had been in wide use before 1991 when the current version was officially adopted by the Flemish Community. That older flag was at times recognized by government sources (alongside the version with red claws and tongue). Today, only the flag bearing a lion with red claws and tongue is recognized by Belgian law, while the flag with the all black lion is mostly used by Flemish separatist movements. The Flemish authorities also use two logos of a highly stylized black lion which show the claws and tongue in either red or black. The first documented use of the Flemish lion was on the seal of Philip d'Alsace, count of Flanders of 1162. As of that date the use of the Flemish coat of arms (or a lion rampant sable) remained in use throughout the reigns of the d'Alsace, Flanders (2nd) and Dampierre dynasties of counts. The motto "Vlaanderen de Leeuw" (Flanders the lion) was allegedly present on the arms of Pieter de Coninck at the Battle of the Golden Spurs on July 11, 1302. After the acquisition of Flanders by the Burgundian dukes the lion was only used in escutcheons. It was only after the creation of the United Kingdom of the Netherlands that the coat of arms (surmounted by a chief bearing the Royal Arms of the Netherlands) once again became the official symbol of the new province East Flanders. Wikimedia Commons has media related to Flemish people. ^ Mainly in the Reformed tradition, although also a scarce population of Lutherans. ^ a b c d "Vlamingen in de Wereld". Vlamingen in de Wereld, a foundation offering services for Flemish expatriates, with cooperation of the Flemish government. Archived from the original on 2007-02-05. Retrieved 2007-03-01. ^ La Flandre Wallonne aux 16e et 17e siшcle suivie... de notes historiques ... - Lebon - Google Livres. Books.google.fr. Retrieved 2013-01-08. ^ Languages in contact and conflict ... - Google Books. Books.google.com. 1995. ISBN 978-1-85359-278-2. Retrieved 2010-08-27. ^ Inquiry by 'Vepec', 'Vereniging voor Promotie en Communicatie' (Organisation for Promotion and Communication), published in Knack magazine 22 November 2006 p.14 [The Dutch language term 'gelovig' is in the text translated as 'religious'; more precisely it is a very common word for believing in particular in any kind of God in a monotheistic sense, and/or in some afterlife. ^ Samples of the black lion without red tongue and claws for the province of East and West Flanders before the regionalization of Belgian provinces: Prof. Dr. J. Verschueren; Dr. W. Pée & Dr. A. Seeldraeyers (1 December 1997). Verschuerens Modern Woordenboek (6th revised ed.). N.V. Brepols, Turnhout. volume M–Z, plate "Wapenschilden" left of p. 1997. This dictionary/encyclopaedia was put on the list of school books allowed to be used in the official secondary institutions of education on March 8, 1933 by the Belgian government. ^ Flemish authorities show a logo of a highly stylized black lion either with red claws and tongue (sample: 'error' page by ministry of the Flemish Community) or a completely black version. ^ "Flanders (Belgium)". Flags of the World web site. 2006-12-02. Retrieved 2007-08-26. ^ Velde, François R. (2000-04-01). "War-Cries". Retrieved 2007-08-26. ^ Olivier, M. (1995-06-13). "Voorstel van decreet houdende instelling van de Orde van de Vlaamse Leeuw (Vlaamse Raad, stuk 36, buitengewone zitting 1995 – Nr. 1)" (PDF) (in Dutch). Flemish Parliament. Archived from the original (PDF) on 2007-09-27. Retrieved 2007-08-26. De Vlaamse Leeuw is the official anthem of Flanders, a region and community in the federal Kingdom of Belgium. The Flemish Movement is the political movement for greater autonomy of the Belgian region of Flanders, for protection of the Dutch language, for the overall protection of Flemish culture and history, and in some cases, for splitting from Belgium and forming an independent state. 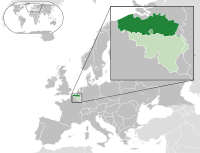 The Flemish Region is one of the three regions of the Kingdom of Belgium—alongside the Walloon Region and the Brussels-Capital Region. Colloquially, it is usually simply referred to as Flanders. It occupies the northern part of Belgium and covers an area of 13,522 km2. It is one of the most densely populated regions of Europe with around 480 inhabitants per square kilometer. Culturally and sociologically, it refers to Flemish organizations, media, social and cultural life; alternative expressions for this concept might be the "Flemish people" or the "Flemish nation". The term "community" should then not be capitalised. Politically, it is the name of which both elements are normally capitalised, for one of the three institutional communities of Belgium, established by the Belgian constitution and having legal responsibilities only within the precise geographical boundaries of the Dutch-language area and of the bilingual area of Brussels-Capital. Unlike in the French Community of Belgium, the competences of the Flemish Community have been unified with those of the Flemish Region and are exercised by one directly elected Flemish Parliament based in Brussels. The Flemish Diamond is the Flemish reference to a network of four metropolitan areas in Belgium, three of which are in the central provinces of Flanders, together with the Brussels Capital Region. It consists of four agglomerations which form the four corners of an abstract diamond shape: Brussels, Ghent, Antwerp and Leuven. Over five million people live in this area, with a population density of about 820 per square kilometre. The Lion of Flanders, or the Battle of the Golden Spurs is a major novel first published in 1838 by the Belgian writer Hendrik Conscience (1812–83). An early example of the historical fiction genre, the Lion of Flanders focuses on the medieval Franco-Flemish War and the Battle of the Golden Spurs of 1302 in particular. It is written in Conscience's typical stylistic romanticism and has been described as the "Flemish national epic".